I just got my Ed degree so I know how tight time can be when juggling student teaching. Really cute quilt! Love it. LOL what an awesome and whimsical quilt! It is so colorful and playful, I love it! Great job,very charming and the bubble wand is such a great whimsical touch. Terrific quilt, so original! I too enjoy raw edge appliqué for the immediate gratification! What a beautiful quilt. Love the circles. 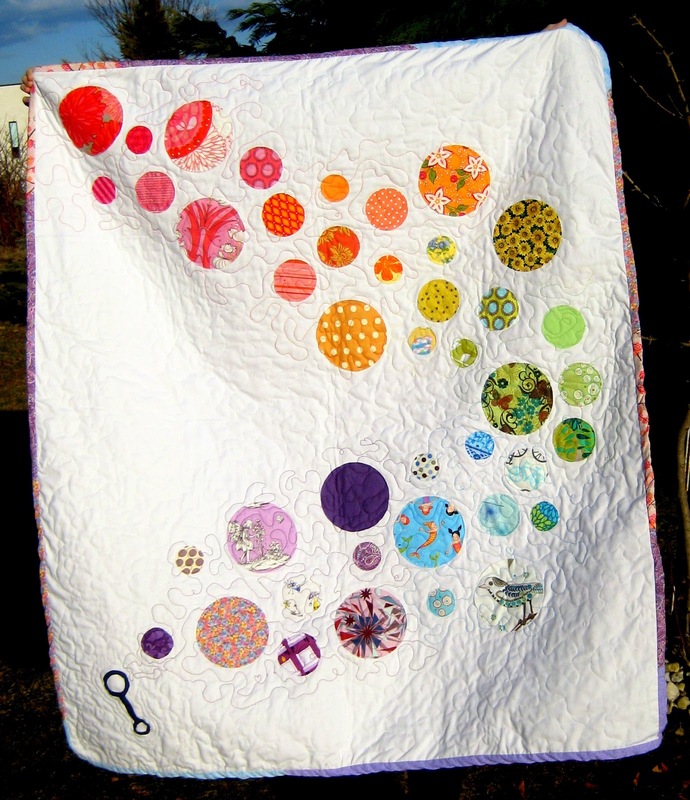 Love it - the bubble wand is a stroke of genius and the rainbow quilting is gorgeous. What a great idea and quilt! Fabulous! I. Love. This. Quilt. So awesome!!! What a neat quilt! Perfect for a baby or anyone, I love raw edge applique too! Seriously love everything about this quilt. It's such a fun concept and executed perfectly. Great job! The perfect quilt for a baby. Lovely!! Utterly in awe of this. Wonderfully creative all the way around! Your youthful energy is oozing from your post. LOVE IT!!!! First you shouldn't have to feel bad about not having much quilting time, I do that to myself a lot and it makes the hobby less fun when I am always feeling bad I am not doing it enough. Think of the millions who never make time for handmade creations at all! Ok and second, I am loving this quilt and as a pregnant woman here I would simply fall over if someone made a quilt like this for our baby! It is s pretty and made with so much love. This baby will grow up with such a terrific quilt. Beautiful!! Very cute baby quilt! Love it! Love your quilt and style. Very original - love the modern look to it and the fabulous quilting! It's a wonderful quilt for a baby! I like the bubble wand idea to go with the circular appliques. Splendid design. Love it, just voted it my fave baby quilt. I nominated your quilt for "Favorite Baby Quilt" - hope you win!! I voted for you too - it'd wonderful! Love it! So wonderfully creative! Great job on the circle placement. I did an applique circle quilt and placing them about drove me crazy. Those look just right. Also I just read your profile, hurray, another quilter in her twenties! And congrats on getting married. Is there anything more exciting?! Congratulations. It's a beautiful quilt. Congratulations on your win! Your bubble quilt is a perfect design for a baby and I'm sure your niece will love it. Congratulations on your win. Its such a cute quilt. Congratulations on your win at BQF. Congrats on the win! I love it! But then I do love Bubbles, LOL! !